El Tri end of the year poll! Mexico takes on the U.S. on Wednesday (4/2) in Glendale, AZ. Mexico has been playing very ugly football. Beginning with a dismal 1-0 over Jamaica, followed by two scoreless draws…everyone who wears green on game-day has been hanging their head. despite the poor showing in June, Mexico is still in qualifying position. Actually, as long as Costa Rica does not lose on Tuesday, Mexico will at worst be in the fourth position. This is not even counting if the USA wins on Tuesday, which in addition will keep Mexico in third position (thanks rivals). On Sunday, Mexico has a big game. It will be a new start. A quick one? Yes. But nonetheless, El Tri can redeem itself just days after the poor 0-0 against Costa Rica. Here are three reasons Mexico and its fans should be excited for the Confederations cup. Mexico is heading into a very talented group. Italy, Brazil (host), and Japan will be going after El Tri guns blazing. But this is a good thing. Mexico has been playing CONCACAF teams who have been paying with eight, nine, sometimes ten players back defending. There will be none of this when Mexico faces off with Italy. No there is no guarantee than all of a sudden Mexico will just dominate. However, this does mean that teams will be playing more into Mexico’s game. The counter is where Mexico likes to punish teams, and the opportunities will be there in this tournament. There are two sides of the coin to this one. Mexico has been known to play better against the bigger names, but then play down to the smaller ones. In the group Mexico is in, there are no smaller teams. All three foes are top nations who want nothing more but to go out and win. We have seen Mexico’s potential in the past, and with all the negativity surrounding them…El Tri will want nothing more but to silence the critics. There is nothing left but to go out and put it all on the line. Mexico does have concerns heading into the cup, but to be honest, so does every team. Italy has looked rusty, Brazil has been on a roller-coaster since 2012, and despite the talent, Japan doesn’t always play up to par with bigger name teams. For Mexico, as mentioned, a good tournament and the momentum will do wonders. Flop out of the tournament? The FMF will make major changes, and new management will take over. If Mexico can’t succeed in the region and international cups with the talent they have, then someone isn’t leading the team efficiently. Will the good and bad pressure make Mexico the better team? Will it make the players wake up? Can they shake off the bad energy? Lots of questions, but there is only one answer…take the pitch and play passionate football for ninety minutes on Sunday. Mexico takes on Euro powerhouse Italy on Sunday, June 16th. Club América has been crowned champions of Liga MX. Their epic comeback in the late minutes sent the game to overtime and then PK’s. América would go on to win 4-2 in the penalty kicks over rival Cruz Azul. With the Liga MX championship achieved, Diego Reyes will prepare to join F.C. Porto this summer. Tijuana faced Atlético Mineiro in the Copa Libertadores this past week. A 2-0 victory was erased late in the game as Atlético Mineiro managed to claim a draw in the home of the Xolos. Tijuana will travel to Brazil to take on the second leg on May 30th. Oribe Peralta will be removed from Mexico’s roster for June due to an injury. Gerardo Flores of Cruz Azul (Defender) will take over his spot. El Tri is already meeting up in Houston to begin training for the Nigeria friendly (May 31st). The friendly will be the only tune up before June WCQ and the Confederations cup. 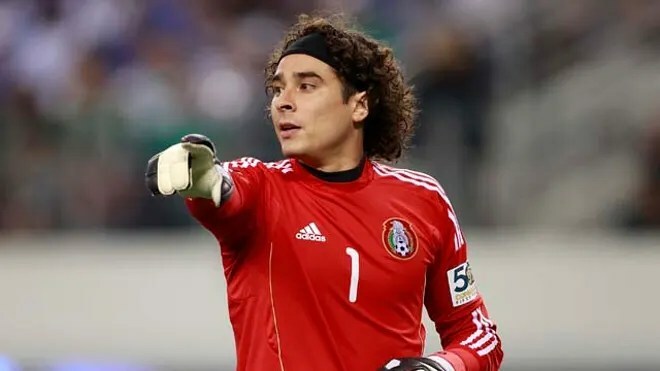 Mexican keeper, Memo Ochoa, may be heading to Italy. His great form has caught the attention of Serie A giant in Napoli. It has been seven months since the USMNT came into Azteca and claimed their first victory in Mexico…ever. Without a doubt, Mexico has not forgotten the images of that game. Given it was solely a friendly; the celebrations by the Americans will not be erased. As of now, Mexico has two points (0-2-0), while the USA has three (1-0-1) after two WCQ matches. There will be a lot of factors coming into this game for both teams, so let’s start off with formations. I believe Chepo is going to stick with Ochoa. His biggest problem was the repetitive kicking of the ball to either Honduran players, or out-of-bounds. It really did hinder what could have been a lot of possession for Mexico. However, his play during the penalty was simply unlucky. He made a terrific diving play, only to have the ball go directly to Bengston. I do not see the U.S. pressuring Mexico, so expect to see the defense bring the ball up most of the time. This will cancel out Ochoa’s goal kicks, and hopefully he will shine like he has before. Two other headlines are the absences of ‘Maza’ and Torres Nilo. Chepo will most likely send Salcido to his former position, and bring in Torrado for “experience” in the midfield. Although, watch for Herrera to make a second half sub for Torrado. His control and dribbling are two features Mexico needs. Chepo de la Torre usually doesn’t start the younger guys, which is why I see an Ayala-Moreno centerback situation. The U.S. will most likely come out with a 4-3-2-1/4-3-3. However, as mentioned before, they are going to sit back. This is not a total must win for them, but more of a “don’t let Mexico get revenge” type of scenario. If the ‘Yanks’ pull a point out of Azteca, they will be jubilant. Moreover, Mexico knows they will be handling the ball for long periods in this game, which is why the 4-2-3-1 should be pivotal. Aquino, Giovani, and Guardado will be in charge of creating the chances, and hopefully find a flustered American defense at their mercy. Lastly, if Mexico see’s itself with a lead, specifically around the 70th minute, Chepo must throw in a 5-4-1 formation. The substitutions during the Honduras match still has fans scratching their heads. A lead around this point of the match would be a perfect time to see Reyes make his WCQ debut. Mexico can still hold possession, all while having the safety of the extra defender. Mexico vs USA will begin on Tuesday (3/26) at 10:30 EST. It is the ‘Clásico’ of the CONCACAF, and both teams/fanbases have been waiting for this game for a long time. …oh and tickets have sold-out. So expect the Azteca to be rocking! The second formation doesn’t have to be identical, but I believe these guys would be able to keep the lead if the game is going in Mexico’s favor. Some may want to see more veterans, but Honduras is a quick team who also is much more better than Jamaica tactically. Frankly if Salcido was getting juked by Jamaican forwards, he will be blown away by the Hondurans. Maza is not starting in my lineup, because I do not believe he should play after his middle finger incident. If Chepo is as “no-nonsense” as he claims, then he needs to send a message to the former “captain.” Diego Reyes has been clutch with Mexico, and even at the tender age of 20, he has demonstrated a lot of consistency over the past two years. He could fill the center-back spot no problem (in my personal opinion). The 4-2-3-1 should be perfect for the counter attack. Honduras is an aggressive team and will not sit back like other CONCACAF teams do. I really believe Aquino and Dos Santos will be great compliments to this team. If Giovani transfers his form from club to country…then Mexico has a perfect fit at #10. I believe Chepo can be more lenient with the lineup against the USA. They are missing a few players, specifically Howard, so they do show some vulnerability. Chances are that Klinsmann is setting up a defensive style when the ‘Yanks’ face off against El Tri. Honduras vs Mexico will begin at 5:00 p.m. EST on March 22nd. Then on March 26th, Mexico vs USA starts 10:30 p.m. EST. *Loss eliminated Mexico in tournament. **Mexico wins playoff on 9-3 aggregate and books ticket to the 2014 World Cup.